A pair of great horned owls is checking out Park Slope to raise a family. The pair is in the central woods of Brooklyn’s Prospect Park. In this climate, these big owls start building nests right about now, in January or February, so they may be moving in for the year. I’ve been seeing them regularly come out at dusk from the same tree, but can’t make out a nest. I’m not sure if the woman who gave me vague clues involving Center Drive, a blue spruce and a body of water was trying to throw me off or what. But I was way off. 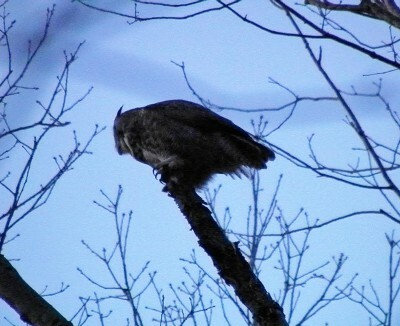 I went out with a neighbor who also had heard rumors of the owl. Turns out even the New York Times has printed rumors of an owl in the Ravine area in a spruce tree. We wandered from the Long Meadow to the lake, flirting with every evergreen. We were about to give up when we hit the jackpot: two women with binoculars. In New York City, you don’t have to be a good enough birder to spot the owl. Just good enough to spot the birders watching the owl. But once you’re in the right spot at the right time, finding the owl is pretty easy because she’s chatty and huge. I’ve gone back since and heard the big girl great horned owl (Bubo virginianus) talking back and forth with her much smaller mate (who I didn’t see). I don’t want to piss off the birding heavyweights of Prospect Park, so I’ll keep the owl code and not point out its exact location. But if you put in a little effort, let me just say that the rumors are true and you can find them.